North Korea and South Korea are still in state of war including different tensions such as: Nuclear, propaganda, cyber attacks, tunnel, invasion, role of the major powers etc. There are no really conclusions or answers as DPRK is playing a game only people who are reached by paranoia can really understand. In a nutshell, if North Korea is carrying out its threats, despite the loss of many lives, it will result on its own destruction. In order to hide the misery of its own state, as Kim’s actions are limited, he based its foreign policy on threats, more or less serious, but serious enough to raise tensions and to attract attention. It is difficult to understand Kim’s strategy for the future, considering that he may not have any strategy. However, despite the image western countries have of North Korea, one of the new weapons of the DPRK, in addition of a possible nuke, is the use of the propaganda through web 2.0. Yes, DPRK has experts in cyber warfare and can launch cyber attacks which can paralyse Seoul for some hours; however, DPRK is also using social media creating a psychological war, as traditional Medias did in the past. Internet access is available in the DPRK, but only permitted with special authorisation and primarily used for government purposes. In 2010, North Korea started to make its first entry into the social media market launching its own website, Facebook page, YouTube Channel, Twitter account, and Flickr page. But North Korea has a different approach of using social media. Considering that the economy is dead in this stubborn country, it is difficult to imagine people tweeting or even sharing videos on youtube. As unified is imperialist North Korea, the DPRK is using social media as a single person, going back then to the use of social media as traditional media, in order to amplify a non-boarder propaganda. Today, most of the webpages or facebook pages are dead link. If not, they are insulting. For example, the BBC reported: “In a recent Twitter post (@uriminzok), the North Koreans said the current administration in South Korea was ‘a prostitute’ of the US”. Nowadays, the twitter account has more than 18 000 followers but is frequently hacked. By definition, Social media refers to the means of interactions among people in which they create, share, and exchange information and ideas in virtual communities and networks, ironic in a country where access to internet is limited and when not limited, websites are censured by officials. The social media is used as a traditional propaganda media, as it reflects the voice of the government. 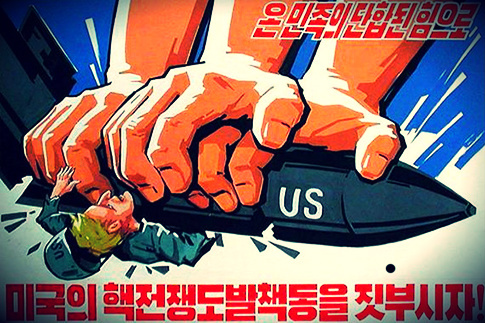 It is however difficult to understand the aim of spreading propaganda on web 2.0., as the recent videos from the DPRK seem more hilarious than a serious threat, using American songs “we are the world” or images, with the only idea to invade America. Considering that North Koreans don’t have access to internet, this propaganda is not targeting anyone particularly and gives less credibility to the possible other, although still unlikely, but real threats. The social media strategy seen as a traditional media, as well as the threatening strategy of any attacks or nuclear capabilities, the strategy of the DPRK is to hide the reality/ the misery of the country and to keep the cult of personality. However, non-boarder propaganda can only be useful if the people targeted have access to this propaganda. A non-understandable strategy with unexpected actions will stay a mystery, but a mystery which can keep the regime alive. This entry was posted on 16/04/2013 by ISIS Europe in François Ducrotté, Opinions and tagged Cyber Security, North Korea, Research and Innovation, Social Media.